In the drawing above you can see the basic circuit. The positive lead from the battery goes through the ignition switch and on to a fuse. From there through a connector to the brake pedal switch and on to another wiring loom connector to the back of the vehicle. It passes through another connector before arriving at the brake bulb holder. The holder is connected to the vehicle chassis via another wiring loom connector. The vehicle chassis is connected back to the battery in the engine bay. You can see we’ve checked the battery voltage with out meter and it reads 12.68 volts… so not a flat battery. We’ll make a note of the battery voltage. OK… so the problem is this bulb is not at full brightness.. so it’s got to be a loss of voltage supplying it somewhere in the circuit. We need to check the voltage along the circuit with the bulb lit (circuit live) and the black negative lead of our multimeter attached the battery negative terminal. (I’ll explain how to do this later). Probably the next place to check it would be the fuse… 12.66 volts, not too bad only 0.02 or 20 mV loss… lets keep going…. ..next is a wiring loom connector, back probing it gives a 10 Mv drop (loss) normally these modern connectors are pretty good. Back probing the next connector gives a bit more of a loss… I’ll come back and check the brake light switch connector. Well 12.13 volts on the bulb contact… so between the battery and bulb positive tip a total loss of 0.55 V or 550 mV…. that’s about within limits as I would not expect to see much more than a 500 mV… half a volt drop on a typical circuit like that. So what’s going on? A 500 mV drop can’t account for the dim bulb? 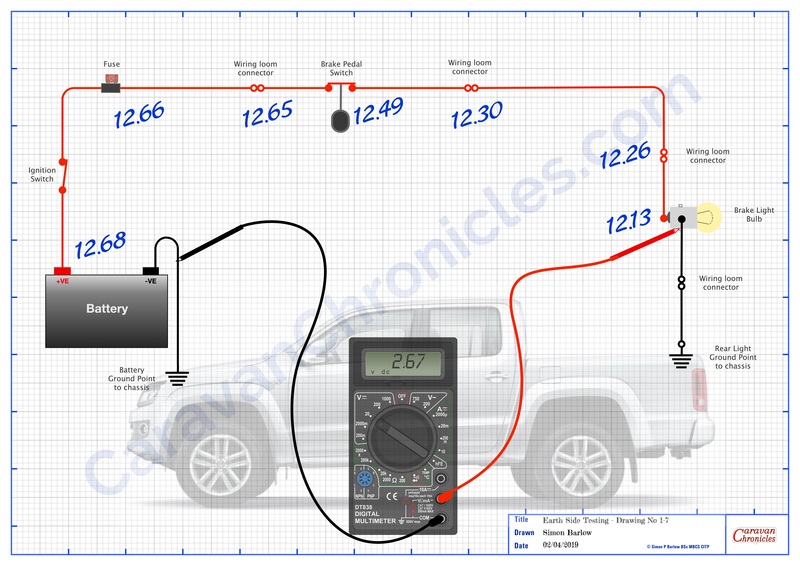 However, if we keep going and measure the voltage on the earth side of the bulb holder…. Hang on we see a reading of 2.67 volts. How can that be? We are connected to ground at both ends of the metwrs test leads? A circuit has two sides, the positive side to the load – in this case the bulb and the return or negative side back to the battery. Just because the negative wire on the bulb holder is only short and goes to a bolt securing it and maybe many others to the chassis doesn’t mean we can assume it is the same as being clamped to the negative battery terminal. A few things to ponder…. vehicles are made of steel… steel is not as good conductor of electricity as copper… nether is aluminium that some vehicles have in their construction. At one time steel panels were all spot welded together… now a lot are bonded on with specialist adhesives. The earth point may well be in the boot or under the floor and will be subject to corrosion as will the main battery neutral cable in the engine bay. All this can compromise an electrical path back to the battery. If we look at the voltage drop on both sides of the circuit we have 0.55 volts on the supply added to 2.67 volts on the neutral side…. 3.22 volts in total, so we are trying to light our bulb with only 9.46 volts. Could we have got there quicker? One of the checks I always do first with the ignition on is the battery voltage check to get a reference to work with and then simply move my red positive test lead over to some main point on the engine block…. If I get a reading of more than 0.4 volts (400 mV) obviously my negative return path from the vehicle chassis is compromised. Time to turn everything off and undo the main earth cables to the chassis and engine and give them and the mounting points a good clean with scotch bright or fine emery and a dab of specialist grease (see “Shopping” below) to protect them from further corrosion. In the scenario we have just gone through, I’ll bet a wet weekend in Blackpool that cleaning both the earth terminal at the back of the vehicle and the battery earth to the chassis would have sorted the problem. I’d also have a look at the brake pedal switch as there is a bit more of a voltage drop than I’d like. Most likely it’s the connector rather than the switch itself. Nearly all tow bar wiring looms will ground to the same point in the back of the vehicle with some of the other assorted vehicle earth cables…. installers take the easy route and if there are already cables earthed there … then another couple won’t make a difference. This can and will have an effect on the performance of your caravan electrics. Both the leisure battery charging circuit and fridge circuit will probably be earthed at that point.. So in the case of the fault above, each of those circuits will have a voltage drop of 2.67 volts. 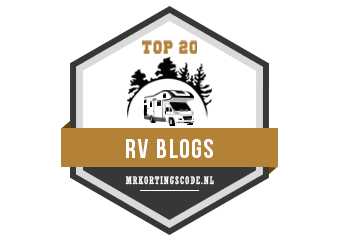 Therefore if you have leisure battery charing or fridge issues its possibly not the wiring in the caravan, it could be the wiring in the vehicle. Check the ground path first. One quick check is with lights and ignition turned on, do a volt drop test between the battery negative terminal and one of the cable secured under the earth point at the rear of the vehicle where the tow pack electrics are terminated. If it’s above 0.5 V (500 mV) then give the earth points a clean. One bit of advice I’ve given to people in the past is to run a 4mm or 6mm cable directly from the negative battery terminal to the back of the vehicle and terminate it at the earth point where all the rear lights and tow electrics terminate. Makes a heck of a difference. Right…. Franky Howard fans stop it now! Back Probing, you might have heard of it and really it’s nothing special. It’s a simple technique used when fault-finding and involves using a fine probe to get into the back of the connector where the cable enters to test the voltage without disconnecting the connector. Sometimes you can get away with a straightened paperclip wound round the tip of the multimeter test lead. You can buy test lead accessory packs that have various attachments or ‘caps’ that fit on the end of your test leads to make the task easier. How do I test between the battery and some other point on the vehicle or caravan? I have made a few of these over the years… basically it’s a long length of wire, about 20 feet with a battery terminal sized crocodile clip at one end and a small crocodile clip at the other… and I don’t know how many I’ve given away to people. I have a couple, one long enough to get tot he back of the vehicle and one long enough to get to the back of the caravan when its hooked up to the vehicle. SImply clip one end to the battery negative terminal and the other to the negative lead on your multimeter. Often its an idea to tie a loose knot in the two leads to stop them coming apart. Caution though, this lead is connected to the ground side of the battery – don’t let it dangle where it might touch something… put a bit of tape for protection around the connection if required. I use Liqui Moli 3140 Battery Clamp Grease – https://amzn.to/2Vn0qSo for battery and chassis terminals. It’s a small tube but does last a while. If you want to make your own long test lead this box of crocodile clips https://amzn.to/2VedU32 for about £4.50 is always handy. If you are into testing or it’s part of your job then there has been something on the market for a while called “Power Probe” Now while the original is obscenely expensive and there are a number of copies out there. The Auto Power scan PS100 is priced at about £80 and does the job in one simple instrument – https://amzn.to/2OJHYAW (Any sponsors out there… hello….hello…) This is on my “I really want one of those” list! As always when working on anything electrical think safety. Oscar our Health & Safety Cat would like to remind you that working on vehicle electrics can be just as dangerous as working on house electrics. If you are unsure then DON’T…. get in touch with someone who is qualified. Find the right person and they will usually help you to do it safely. Be like Oscar – Be Safe. Hats off to you Mr. Barlow for a very easy to follow fault finding process. I do have a multimeter but I’m just dashing off to the shed to make an extra long cable (may have to get some crocodile clips from Amazon) and fault find the headlight indication staying on even with the lights switched off on my tractor. No doubt this is the reason for my flat battery. Thank you for your ongoing useful series of articles.